I have accumulated a small collection of jars and bottles in different sizes and shapes over the years. My favorite is Mason jars and plastic peanut butter containers. These containers will be put into good use this summer. The weather in California is pushing temperature of mid 80-100 degrees in some inland areas. This is excellent for using the power and energy of the sunlight as the heat source to set dyes from plant pigment onto fiber and fabric, derived from plant materials. 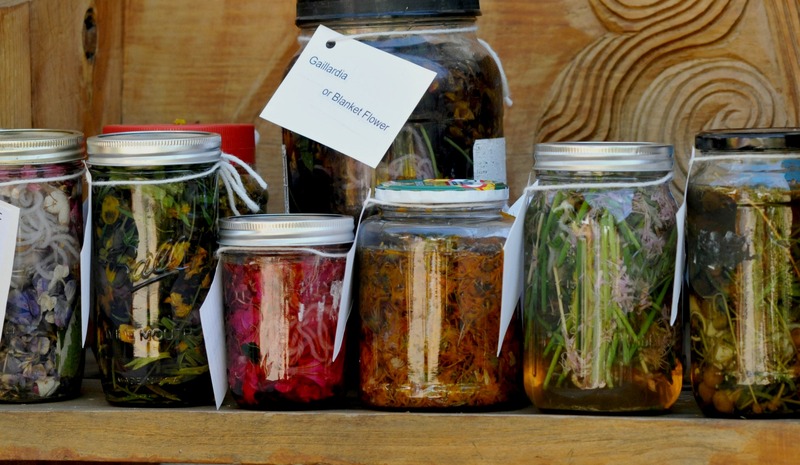 It is an economical method of natural dyeing using plants and flowers from our garden. After a morning’s work of pruning, I have an assortment of plant materials to fill up the containers. Inside each container, I put in a small piece of fabric and some wool yarn, plant materials, and water. 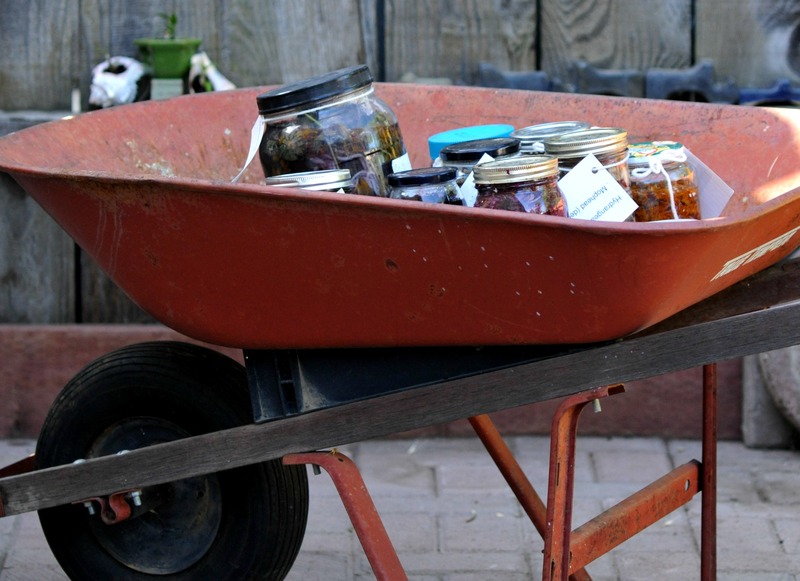 After labeling each jar of its contents, I placed the jars inside a rusty old wheel barrow and set it out in the sun. The heat and energy from the sun would radiate and heats up the metal to warm up the jars. It also allows me to move the jars to where they can get the most sunlight. I will leave them outside in the sunlight for several weeks in the garden. In the interim, I will continue to add more to this collection, until I run out of jars or random ideas of plant to use. For the meantime, I will wait to see the results when I open the jars in a month or so. Check back soon, and have a cool and pleasant summer. 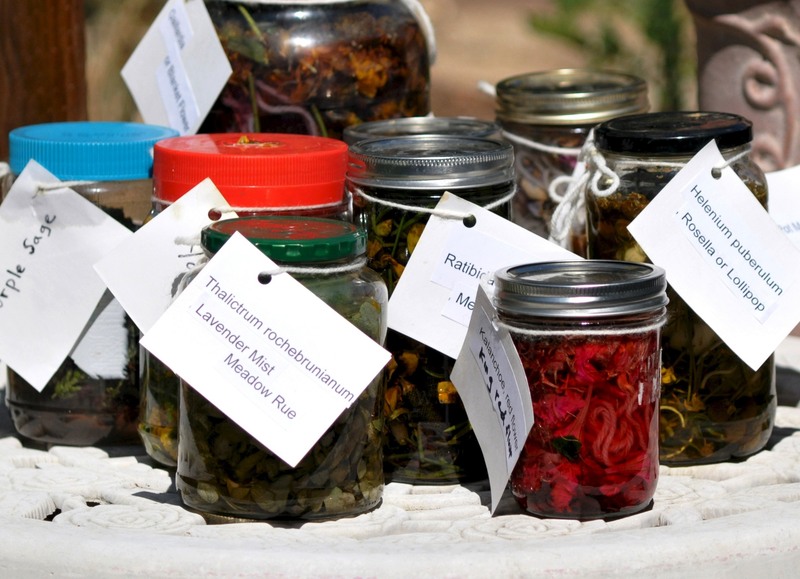 This entry was posted in dyeing, garden, seasons, solar dyeing and tagged botanical, eco-dyeing, eco-friendly, Mason jars, natural dyeing, plain and simple, silk, solar dyeing, solar energy, summer dyeing, sun kissed dyeing. Bookmark the permalink. What a wonderful idea. I look forward to trying this. Thanks for sharing. thanks Marlene for dropping by. Have a lovely 4th. What a great idea. Thanks for sharing and one question: Can plastic jars work as well as glass? I have large peanut butter jars, but they are plastic! I used glass mostly, and some plastic sometimes–as long they are thick enough.